Summary: In the magical underworld of Victorian London, Tessa Gray has at last found safety with the Shadowhunters. But that safety proves fleeting when rogue forces in the Clave plot to see her protector, Charlotte, replaced as head of the Institute. If Charlotte loses her position, Tessa will be out on the street and easy prey for the mysterious Magister, who wants to use Tessa's powers for his own dark ends. 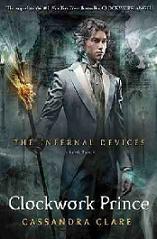 Review: Felt like you were left hanging with Clockwork Angel? Questions left un answered? You needed more? More of Will's cockiness, more of Jem's kindness and more of Tessa's amazing smart and all around bravery? Well here this novel is in all its glory. Their back! The awesome Victorian shadow hunters who had us all on the edge of our seats! And as happy and sad tears drop on pages of Clockwork prince I truly wonder how Cassandra Clare could get through writing such a heart breaking beautiful book. I think its so descriptive and effective as you read this novel you can literally close you eyes and imagine the smells and surroundings. Cassandra has created word images so vivid that it is almost like watching a period movie. She takes you for a romp through Victorian London infested with demons and find yourself in a action packed suspenseful event that had my heart facing and excited from beginning to end. This is a book for all tastes. This skilfully craft novel contains some mysticism, mystery, intrigue, humor and romance in a neat package that is not just entertaining but challenges your mind and imagination. Jem and Tessas relationship defiantly grows through out this novel in more ways than one. Tessa and Will are still as complicated as ever, their sexual tension, the poetry, the beautiful words shared between them was just so emotional and you just wanted everything to work out between them. Their scenes are so beautifully written that it has you swooning through out! Also there are some new characters in this novel I would be here all day if I talked about them all but I will say this. If you like challenging, scary, brave characters then this is the book for you. The plot is fantastic and so orginal! Twists, turns, mysterious, haunting moments. Things you never saw coming did! I enjoyed every page from beginning to end .As soon as I opened the novel it was so haunting and exciting. It had my pulse facing, heart pounding tears rolling down my face and smiling with excitement. This book brought me in straight away and I couldn't believe how many jaw dropping moments there truly was!